Amongst the Khalifate developed a special unit, the Hashishin. They are truly the best assassinators. The Hashishi assailants are trained in techniques of hand-to-hand combat, and also carry daggers. Their most preferred weapon for a kill from behind are multiple knives dipped in poison. However, the Hashishin became best known for their excessive psychoactive drug abuse, hence the name: hashish. The only downside of this practice in an army is, that by altering the visual, auditory, and olfactory senses, the drugs lead Hashishi sometimes to poison the false person, even merry comrades. Special Notes: This unit’s marksmanship gives it a high chance of hitting targeted enemies, but only on the attack. 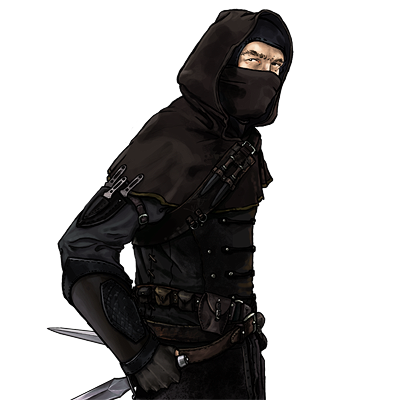 The victims of this unit’s poison will continually take damage until they can be cured in town or by a unit which cures. This unit is able to hide at night, leaving no trace of its presence. Whenever its berserk attack is used, this unit continues to push the attack until either it or its enemy lies dead.